On 19 December 2011, the launch vehicle for the PromISSe Mission was transferred from the Assembly and Testing Facility to the launch site (Baikonur Cosmodrome, Kazahkstan ) in this cool space wallpaper. 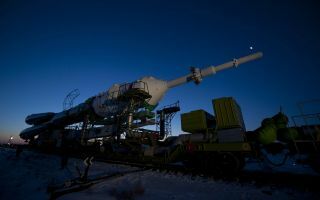 André is scheduled to be launched on 21 December from the Baikonur Cosmodrome, in Kazakhstan, on a Soyuz spacecraft as flight engineer for Expeditions 30 and 31, together with Russian cosmonaut Oleg Kononenko and NASA astronaut Don Pettit. They will remain in space for nearly five months as part of the resident, international six-astronaut crew.